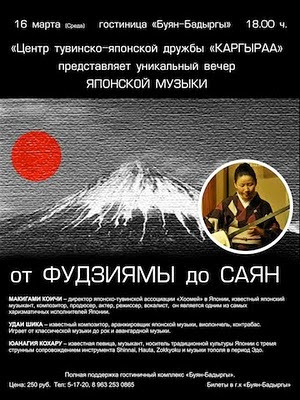 Makigami has uploaded a video of duo performance by Onder Mongun-ool and himself, recorded at Kyzyl Theater of Tuva in March 18 2011. 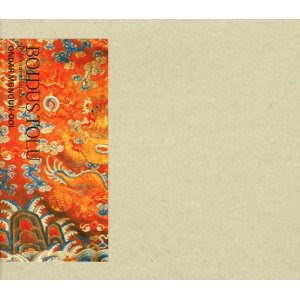 In 1998, Makigami produced a solo album of Mongun-ool entitled "Boidus Tolu - Khoomei Rainbow" which is available worldwide via HMV Japan. See here for the information. Regarding Makigami's recent visit to Tuva, there is an article in Russian. I provide a link to the original and google translation. In April 2011, Makigami Koichi organizes a Japan tour of his Cho-kayou (super kayou) concert. It features the repertoire from his Japanese songbook albums, "Minzoku No Saiten" (1982) and "Koroshi No Blues" (1991), plus other things including jazz, klezmar, electro, tuvan throat singing, and collective improvisation. His entourage for the tour is the musicians whom he has been played with and trusted for years - the members from Hikashu or his cho-kayou ensemble. Cho-Kayou is the term that Makigami coined in early 1990s. It is his own interpretation of Kayou, which roughly means Japanese popular songs from 1920s-1980s (Actually, "Kayou" is not a genre - its scope is so wide and vague, and there is no exact definition for it). There is an article about Kayo (or kayo-kyoku) in wikipedia, here. Originally, in April 2011, Makigami planned to do a Japan tour of Food, an electro jazz unit consisted of Thomas Strønen and Iain Ballamy, also Nils Petter Molvaer on trumpet, and the vocalist-organizer himself would join as guest. Unfortunately, the ongoing earthquake and nukes problems prevented them to come. But Makigami didn't want to give up the opportunity and felt the importance of making music at this difficult time. So he decided and promptly arranged a tour of his own instead. 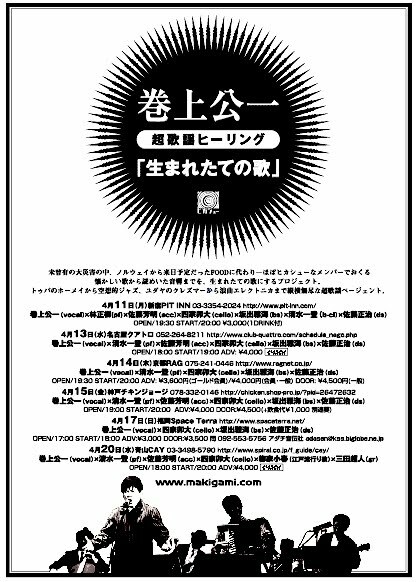 In the past, Makigami seldom did his cho-kayou concert outside Tokyo (in early 1990s he did a cho-kayou concert in NYC but that's an exception). So do not miss it. * Tokyo dates might be cancelled if the condition is not suitable. Makigami Koichi (vocal, cornet), Shika Udai (cello), Sato Masaharu (percussion) [all dates except Aoyama], Sato Yoshiaki (accordion) [Shinjuku, Nagoya, Kobe and Aoyama], Shimizu Kazuto (piano, bass clarinet) [Nagoya, Kobe and Aoyama], Hayashi Masaki (piano) [Shinjuku and Fukuoka], Yanagiya Koharu (shamisen) [Aoyama], Mita Freeman (guitar, vocal) [Aoyama]. Also Sakaide Masami (bass) on some dates. Flyer of the tour. The PDF file can be obtained here. John Zorn, a prominent saxophonist, composer, record producer and collaborator of Hikashu, organized FIVE benefit concerts for Japan, in New York City. Its roster is truly incredible: Yoko Ono, Cibo Matto, Marc Ribot, Sonic Youth, Ikue Mori, Milford Graves, Lou Reed, Bill Laswell and much more. See the complete lineup and more information at the John Zorn MySpace site. It is not directly operated by Zorn or any Tzadik personnel but under the permission from the party, and pretty informative about Zorn and his activities. 100% of the admission sales from this events will go to the Japan Earthquake Relief Fund. We would like to express our foremost gratitude to Mr. Zorn. Today huge earthquake hit Japan. Makigami was in his home and said he's okay via twitter. He also said that he probably have to give up going to Tyva this weekend. Fortunately, Makigami succeeded to catch a flight to Peking. He's now in Krasnoyarsk, and going to Tyva. Having successfully completed all the performances in Tyva as scheduled, Makigami and his company are en route to Tokyo. Also, it is announced that the Shibuya gig on March 21 will take place accordingly. Monsieur Delire on "Ten Ten Ten"
Unbeknownst to me for quite some time that Monsieur Délire, the radio program of advanced music in Quebec, has reviewed "Ten Ten Ten" on last January. This Japanese avant-rock group (experimental vocalist Koichi Makigami's main vehicle) has been around for a long time, and yet 2009's Tententen is my first foray into their discography. I'm favourably impressed. Hard to make comparisons, since this is less “extreme” than most of my Japanese references (Ground-Zero, Boredoms, Koenjihyakkei, Melt-Banana). Songs with creative and expressive arrangements, occasionally complex rhythms, jaw's harp gets a lot of spotlight time, and Koichi's vocals of course. Not striking (given the preceding references), but I do like Makigami's voice, and this is convincing enough to warrant a more thorough investigation. Nice review. The band needs to be exposed in overseas media in order to have a proper appreciation outside Japan, so the opinion like theirs is precious and very encouraging. Hopefully more to come. The original entry is here. To the people of Ottawa and Victoriaville: On coming May, Makigami and his company will go to your place to perform. Just check out the article here. On March 21, Hikashu will appear at La Mama in Shibuya, Tokyo. The date is a triple bill program, and actually quite an interesting one, because the other two acts represent the musical tradition of Japan respectively. Isso Yukihiro is a player of noh-kan, a sort of wind instrument. Noh-kan is used in Noh, a traditional play that has been performed since the 14th century (wikipedia). Isso was born in a family of long musical tradition in Noh and made his first public performance at age nine. Also he has been highly motivated and very active for exploring other fields, performed with musicians in various genres. For example, he has recorded an album with Peter Brötzmann, the free jazz giant from Germany. For the Hikashu fans, he is known to be one of the guest musicians who took participated in "Kawatteru," the group's album released in 1996. In it, he played a radically rearranged version of "Ningen No Kao." Tsuboy Akihisa is an electric violin player, deeply rooted in western progressive rock of 1970s. Now mainly active in jazz field, he combines an electric violin with various effects and succeeded to establish a distinctive sound of his own. He is also a member of the Isso Yukihiro group. Oedo Sukeroku Taiko is a Taiko (Japanese drum) ensemble formed in 1956. Their music was started as an accompaniment of Bon Odori - a traditional festive dancing in Summer, and later they established themselves an independent musical ensemble of high regard for themselves. They have various formations, but for the event, it is a quartet, and all the four principle members get together for the date. of the Tyva Republic with the two other musicians from Japan, Isono Yoko (shamisen) and Shika Udai (cello). Recently The Tyva-Japan Friendship Association "Kargyraa" is approved as an official organization from the Tyvan government. And there will be held a ceremony for celebrating the approval on March 16, then a commemorating concert on March 18. Makigami and his company are invited to the event. The relationship between Makigami and the country is a long and deep one. 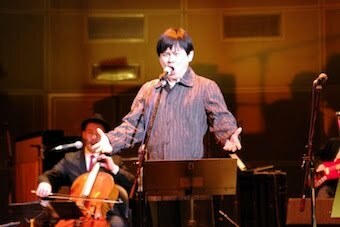 In 1994, he witnessed the performance of a Tyvan ensemble of throat singing for the first time. Profoundly impressed, he asked them for teaching the singing on the scene. 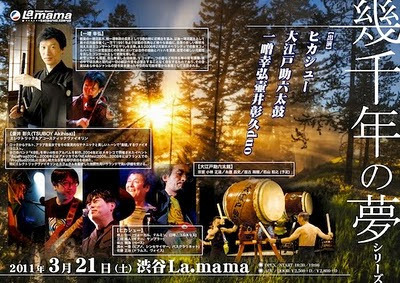 Being fascinated the musical tradition of the country, he formed the Japan Tyva Khoomei Association in 1996 and started to produce the recording and concert tour of the Tyvan artists in Japan. Meantime, he has been visiting the country every year since mid nineties. Now being one of the most famous Japanese in the country, Makigami is not only a musician but sort of an independent cultural ambassador for Japan. Simply put, it is a matter of course to say he is right person for the position. Besides his qualification as an artist, what he has been trying to do is to build a cultural bridge between both the countries. And this time, he will fulfill the role once again - celebrating the musical culture of Tyva. There is an article about the music of Tyva in wikipedia. See here.